In recent decades the doctrine of salvation has become a key issue in international ecumenical conversations between Lutherans and Roman Catholics and also between Lutherans and Eastern Orthodox. The 1998 Joint Declaration on Justification between the Vatican and the Lutheran World Federation is a historic milestone in those efforts. Advances in ecumenical conversations have challenged the traditional opinion according to which the Lutheran view of justification by faith has been thought to be opposed to both the Eastern Orthodox doctrine of theosis (deification) and the Roman Catholic view of justification, which also includes sanctification. In One With God Karkkainen points out that amidst all the differences between the East and West with regard to theological orientations and the language and concepts for soteriology, there is a common motif to be found: union with God. Both the Eastern understanding of theosis and the Western idea of justification have union as the ultimate goal. The UnitasBooks series seeks to serve the rethinking that is a necessary part of the ecumenical movement. Some books in this series directly address important topics of ecumenical discussion and others chart and analyze the ecumenical movement itself. All are concerned with the Church's unity. The authors are ecumenical experts from a variety of Christian traditions and the books are written for a wide audience of interested clergy and laypeople. This series clarifies, criticizes, and advances reflection concerning the unity of the Church. 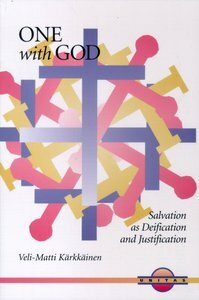 Chapters are "Salvation in the Union," "Justification in Recent New Testament Scholarship," "Theology," "Deification, Union, and Sanctification in Later ProtestantTheologies," "Salvation as Union: Towards an Ecumenical Convergence," and "One with God: In search of a Consensual View of Salvation." Veli-Matti Karkkainen (D.Theol and DrTheol, Habil, University of Helsinki) is professor of systematic theology at Fuller Theological Seminary and also holds a teaching position at the University of Helsinki as Dozent of Ecumenics. A prolific writer, Karkkinen has published 11 books in English (and seven in his native language, Finnish), most recently The Trinity: Global Perspectives (2007), One With God: Salvation as Deification and Justification (2004), and Trinity and Religious Pluralism: The Doctrine of the Trinity in Christian Theology of Religions (2004), Pneumatology: The Holy Spirit in Ecumenical, International, and Contextual Perspective and Christology: A Global Introduction. as well as more than 100 articles, which have appeared in international scholarly journals. He is also the editor (with William Dyrness) of Global Dictionary of Theology (2008). He is a member of three working groups of the World Council of Churches and has participated in numerous international consultations. He is also an external examiner for Wales University. Chapters Are "salvation As Union," "justification In Recent New Testament Scholarship," "deification In The Eastern Orthodox Tradition," "justification And Deification In Martin Luther's Theology," 'deification, Union, And Sanctification In Later Protestant Theologies," "salvation As Union: Towards An Ecumenical Convergence," And "one With God: In Search Of A Consensual View Of Salvation."